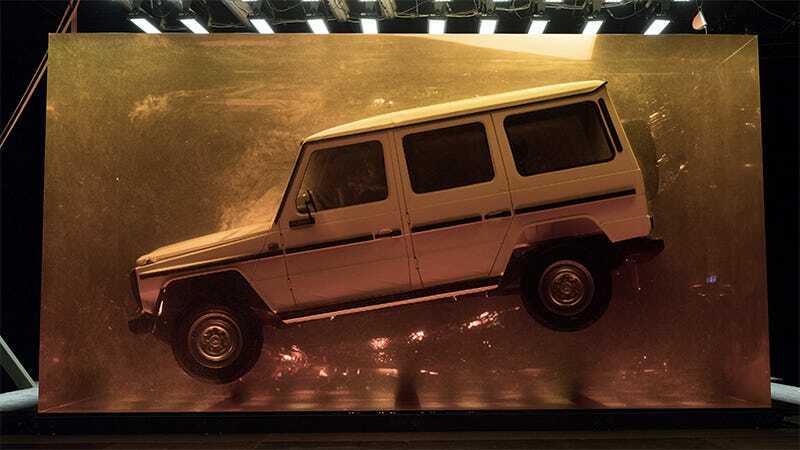 The next-generation Mercedes G-Wagen is being hatched within the next few days at the 2018 Detroit Auto Show. I guess that makes this ’79 280 GE encased in “amber” the blueprint provider. This old OG G Class is actually stuck in amber-colored synthetic resin. About 98,000 pounds of it, according to Mercedes’ press release. The tagline for the new SUV’s reveal event is “Stronger Than Time,” so, you get it with the whole dinosaur DNA thing, right? Looking at the profile of this almost 40-year-old 4x4, it really is amazing how little the G Class has changed in so many decades. I might even guess that the AMG variant makes a higher profit margin than anything else on the road, by virtue of its assembly tooling being older than most of our writing staff. We already know that the new G won’t stray too far from the polished brick look we’ve come to recognize, but I’m still excited to see how the updated version of this old SUV feels.